NEWARK — Michael Walker has never been one to back away from a challenge. 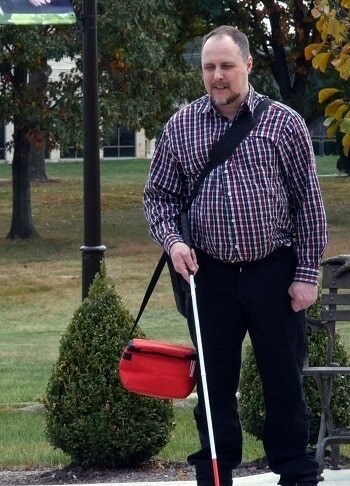 That’s why the 44-year old Newark man, who is blind, decided to go back to school at Central Ohio Technical College and double major in Accounting Technology and Information Technology. Walker was born with a retinal condition called Leber Congenital Amaurosis (LCA). LCA is an inherited retinal degenerative disease which results in the loss of sight over time. Walker was diagnosed when he was four years old. Walker said he was able to live life like a normal kid for a while. He rode a bike and played Frisbee with his friends. After high school, Walker started taking classes at COTC. He said he wasn’t sure what he wanted to do and ended up quitting school. Walker moved to northwest Ohio and started working in the vending industry stocking machines at highway rest areas. With the help of the COTC Office for Disability Services, Walker got back into the classroom. Walker has a student worker who sits with him in class to help with class presentations and taking notes. Walker also uses a recorder to capture the lecture, so he can listen later. There is one area where Walker does not accept help – navigating the 155 acre campus. This year is the 25th anniversary of the Americans with Disabilities Act (ADA). The act was signed into law on July 26, 1990 by President George H. W. Bush. The ADA prohibits discrimination and guarantees that people with disabilities have the same opportunities as everyone else to participate in the mainstream of American life – to enjoy employment opportunities, to purchase goods and services, and to participate in state and local government programs and services. Walker is scheduled to graduate in the spring of 2016 with his Information Technology degree. He has another year of classes to take before he can complete the Accounting Technology degree. After graduating with both degrees, Walker said he hopes to use his skills working in an accounting office.